Schluter®-RENO-U provides a smooth transition from tile floor edging to floor surfaces at a lower elevation or finished concrete. Available in twelve color/finish options the RENO-U is sure to compliment any decor. The leading edge of the profile abuts the lower surface covering, and the sloped surface (about 25°) provides a smooth transition, helping eliminate trip hazards. This profile features a trapezoid-perforated anchoring leg that is designed to be secured in the mortar bond coat beneath the tile. RENO-U in anodized aluminum is designed with an integrated joint spacer that creates a defined joint cavity between the profile and the tile. Height: Height: 1/8", 5/16", 3/8", 7/16", 1/2", 9/16", 11/16", 3/4"
Available in: Stainless Steel 304, Brushed Stainless Steel 304, Solid Brass, Satin Anodized Aluminum, Bright Chrome Anodized Aluminum, Satin Nickel Anodized Aluminum, Brushed Nickel Anodized Aluminum, Satin Copper Anodized Aluminum, Brushed Copper Anodized Aluminum, Brushed Antique Bronze Anodized Aluminum, Satin Brass Anodized Aluminum, and Bright Brass Anodized Aluminum. Height: 1/8", 5/16", 3/8", 7/16", 1/2", 9/16", 11/16", 3/4"
ADA-Compliant in installations where the leading edge abuts a lower surface covering in all sizes except 3/4" and 11/16". 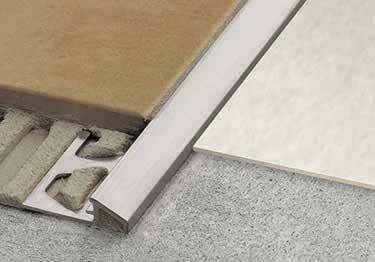 When leading edge rests on top of lower surface covering, sizes 3/4", 9/16" and 11/16" are not ADA compliant. Trapezoid-perforated anchoring leg designed to be secured in the mortar bond coat beneath the tile Profile length: 98.5"
Used it to patch in during a renovation. Thank you for your review. We're pleased our product worked out well and it was a prefect match for your project. It worked great as a transition between rubber flooring and carpet.